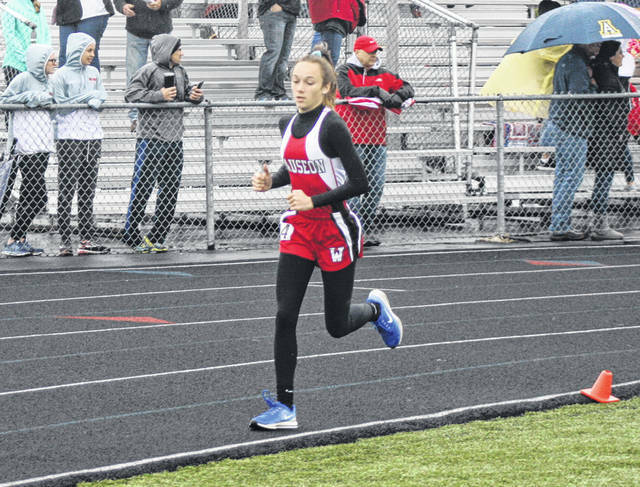 Sam Aeschliman runs for Wauseon at the Division II district meet last season. She returns for the Indians after qualifying for the regional in the 1600 meter run as a sophomore. 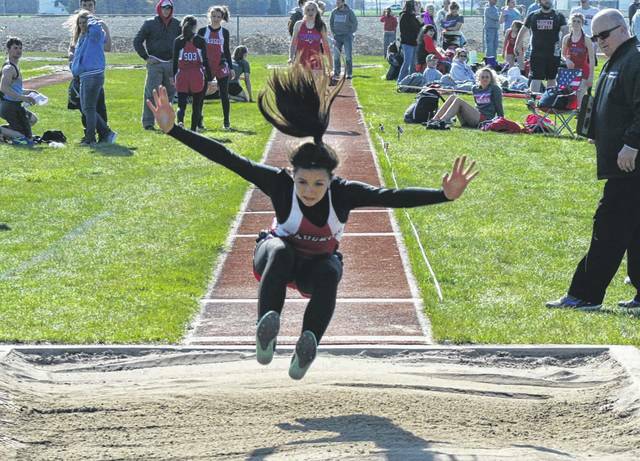 Wauseon’s Paige Allison Smith in the long jump at a meet last season. Smith was a regional qualifier in the 200 meter dash for the Indians. The Wauseon girls track and field team looks to carry on the tradition of the program’s past as they embark on a new season. They will be led by a list of 17 returning letter winners. Leading the Indians is junior Sam Aeschliman who was a Northwest Ohio Athletic League champion in both the 1600m and 3200m, and was a regional qualifier in the 1600m. Also returning is Paige Allison Smith, a regional qualifier in the 200 meter dash. They also have Josephine Callan, Zarhea Carroll, Keyarra Gorsuch, Bailey McGuire, Emily Parker, Leanne Pownall, Chaney Sigg, Megan Carroll, Amanda Wendt, Sydney Zirkle, Jessica Perez, Hannah Richer, Paige Alexandria Smith, Delanie Roush and Ashtyn Falor. Newcomers who will add depth for the Indians are Tatum Barnes, Leah Beltran, Kaylyn Demoulin, Arianna Dominique, Magdalena Duden, Cameron Estep, Jadyn Fisher, Chie’anne Fitch, Halle Frank, Adriana Garcia, Kaitlyn Gype, Marie Hutchinson, Saige Johnson, Jordan King, Jasmine Love, Jadelyn Maness, Serena Mathews, Eva Mennetti, Marisa Seiler, Faith Stinner, Madison Strauss, Alexandra Angelini, Viktoria Trnkova, Natasha Miller and Shaylynn Wandtke. The trouble for Wauseon will be putting their best athletes in the right event. In terms of the league race, the Indians will look to match or perhaps surpass their finish from 2018. They finished as NWOAL runner-up to Liberty Center a season ago.